Inkable’s A3 posters are always in demand—commanding enough to get your attention, with enough space for printed messaging and images without being too imposing. 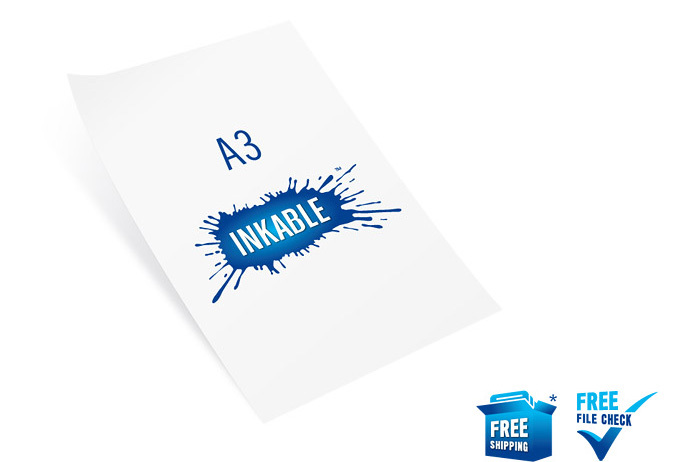 They are the smallest size available next to (half the size) Inkable’s A2posters. Competitively priced, our finished 420mm by 297mm mini billboards are suited forPROMOTIONAL (event and concert posters, seating plans, seasonal sale announcements), EDUCATIONAL (reception area posters, school or company events, point-of-sale posters, establishment features), and PROFESSIONAL (exhibition or show photos, design and art prints, family portraits) purposes. TIP: Although this is our smallest poster size option, you can opt to extend your messaging with 2-sided Full colour printing, to give you a total area similar to that of a 1-sided A2 poster. Place them on transparent surfaces such as glass windows to feature both sides of the poster.